They are loaded with over 600 inspiring, hand selected famous quotations. 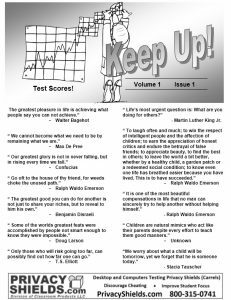 Each weekly Issue provides positive motivation to inspire your students. We’ve provided two document types for you to use below. Add your name to our free worksheets and personalize any way you want by choosing the Word .doc versions below. If you prefer not to personalize the worksheets “Click” any link below to view or download in pdf format!